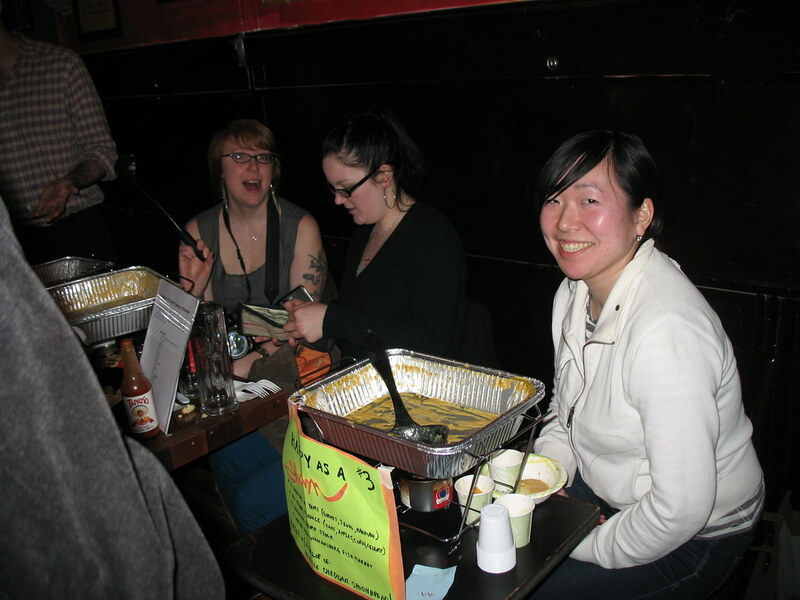 Thanks to fourteen chowders, it was warm and clammy in the back room of Jimmy’s No. 43 on Saturday. Fifteen, if you counted the pot of Manhattan-style chowder that the restaurant’s resident chefs cooked up as extra, which was still going strong by the end of the event and made a perfect straggler second-course. But the real battle was fought by the amateurs. 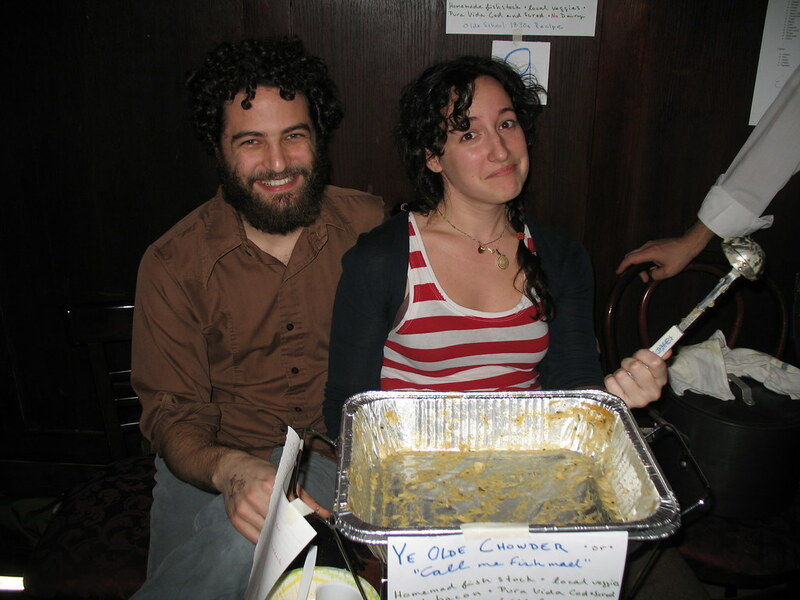 This time, the cook-off community of NYC was drawn a wildcard dish du jour: chowder. And a mean chowder they responded with, which was for many of them their first try at cooking the dish. 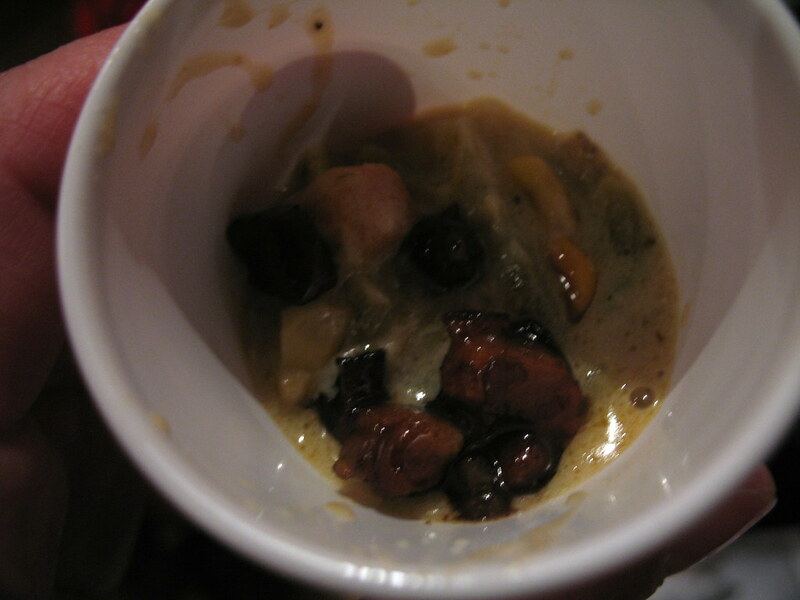 In addition to the six contestants who offered a sneak peek on Friday, all of the chefs really set themselves apart with unique and varied takes on the hearty soup. So much so, that the judges (Lucinda Scala Quinn and Katie Goldberg of Martha Stewart Omnimedia) decided to hand out awards for two categories: From the Land, and From the Sea. Not everyone sided with seafood for their entry. Many-time local cook-off champion Theo Peck called his lamb belly chowder “Silence of the Clams,” connoting its lack of the popular chowder shellfish. Emphasizing seasonality, his chowder was heavy on parsnips and potatoes, and was infused with curry leaves for an herbal, spicy bite that paired well with his gamey home-cured lamb belly. Not to my surprise least of all, Theo won the “From the Land” category. He was rewarded with a $100 gift certificate to Jimmy’s No. 43. Moving on to the seafood entries, contestants focused their dishes on everything from shrimp and scallops to lobster and, yes, clams. Contestant Zoe Feigenbaum took runs from the kitchen to the back room to garnish her chowder with crispy, deep-fried codballs. Karol Lu paired her homemade shrimp stock-based chowder with sweet potatoes for a surprisingly tasty, sweet and savory finish. But in the end, it was Rachel Graville’s classic white wine and creme fraiche-based scallop chowder that won over the judges for the “From the Sea” category. 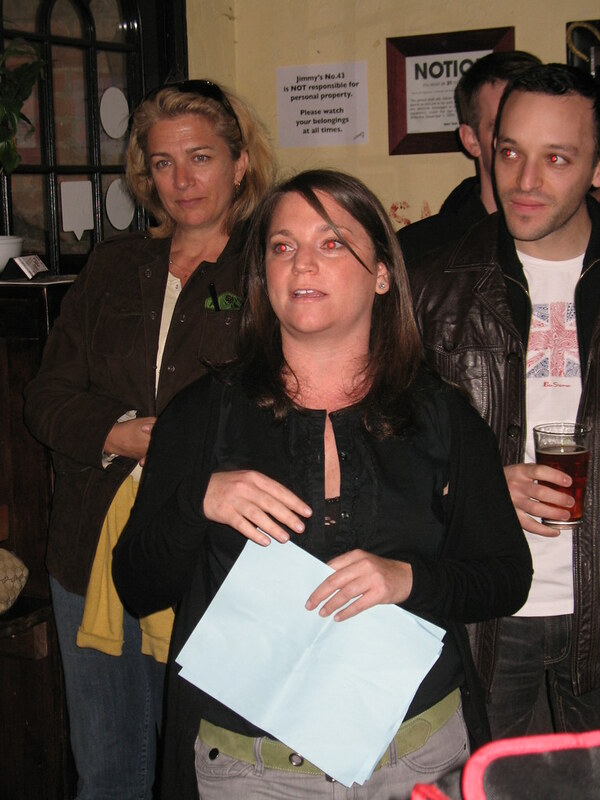 Rachel, an events manager for Edible Manhattan, won $100 worth of fresh seafood from Fulton St. Fish Market (do I have that correct?) The Lobster Place at Chelsea Market. Last but not least, there was the audience vote award. First off, the $20 donations from all the attendees at the Chowder Slam helped raise more than $2,000 for the New Amsterdam Market. The market, which supports local, artisanal and sustainable food purveyors, hopes to become a regular fixture in New York City soon; by the summer they hope to host outdoor markets every few weeks at the historic South Street Seaport. Plans are underway, and the Chowder Slam at Jimmy’s No. 43 is just one of the ways that the market has been having good food fun with fundraising. As the event rolled on from noon to around four o’clock in the afternoon, it’s hard to tell how many tasters came, ate and voted. But at the end of the day, they’d voted decisively. 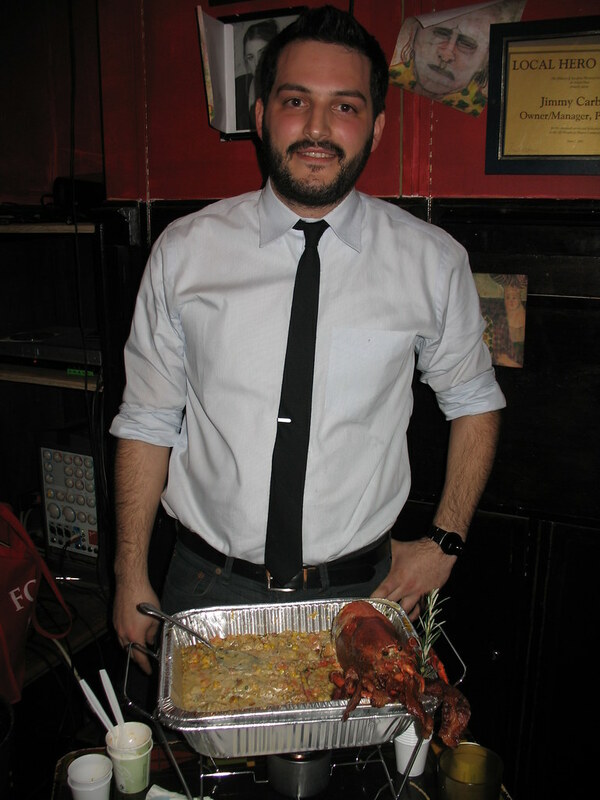 “By a landslide,” the audience choice award went to Nick Suarez, for his ridiculously chunky, creamy, crispy bacony-topped lobster and corn chowder (called “Pigs Can Swim”). It’s the one pictured at the top of the post in poor lighting. Nick won $100 for his effort, and a bolstered ego as he heads into the Bacon Takedown next Sunday. In fact, a few of the contestants at the Chowder Slam will be rolling up their sleeves once again in the kitchen, entering the Bacon Takedown. 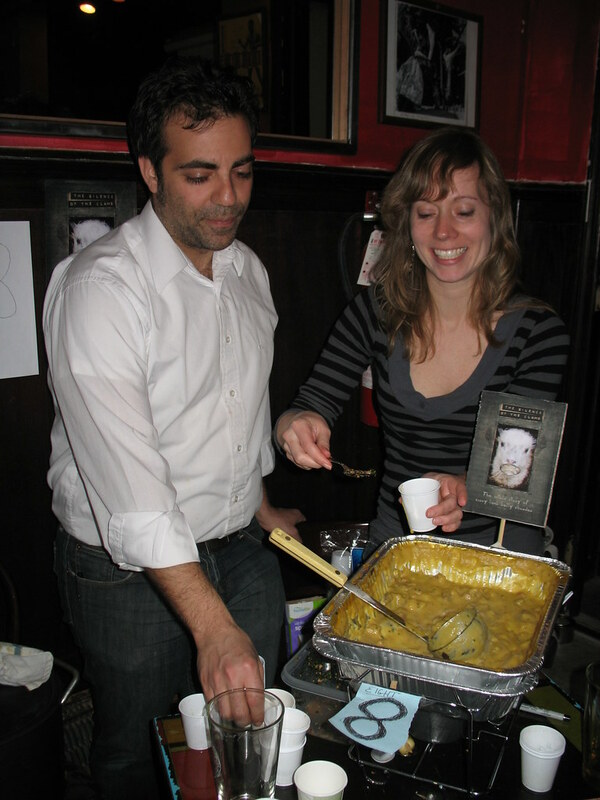 Theo, Nick and Melissa Sands (whose creamy, chive-topped chowder was overlooked on Saturday but, for the record, Melissa, happened to be the favorite of Village Voice food critic Robert Sietsema!) will all be competing at Matt Timms‘ latest cook-off creation on the 29th, to be held at Radegast Biergarten in Williamsburg. Them, along with some twenty-seven other contestants. Brace yourselves, Brooklyn, this one is going to be brutal. I’ll be there for moral support if you need me. 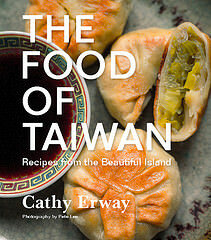 What a fun time and I love the idea of parsnips in my chowda’. i think theo is officially unstoppable!!! holy crap. Thanks to all that attended. 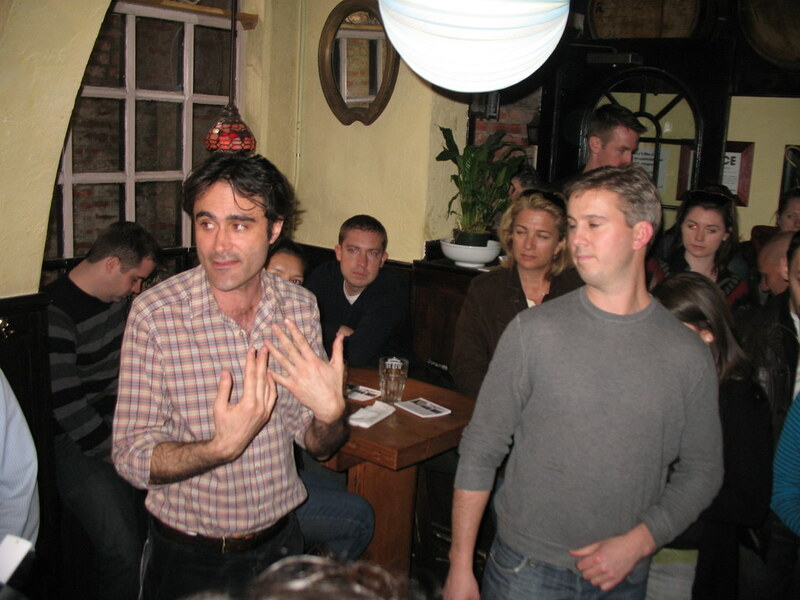 Note – the “from the Sea” winner received a $100 gift certificate courtesy of the Lobster Place at Chelsea Market. Mmm, I’m sorry to have missed this one! !